Necklet made from a long piece of light brown plant fibre cord (Pantone 7508C), made from multiple twisted strands, onto which have been strung 26 large elongated biconical beads carved from light brown wood (Pantone 7508-7509C). Each bead has been cut flat at either end and pierced through its length, with the hole often being off-centre; their surfaces are covered with tool marks showing how they have been whittled to shape. There are some signs of polish, particularly around the carination of each bead. The two ends of the cord have been knotted together at the top of the necklet. The object is complete and intact, although there appears to be some wear on the ends of the beads, where they have rubbed against one another. It weighs 87.7 grams. The string has a length of 422 mm, when doubled; the beads vary slightly in shape, but a typical example has a length of 31 mm, 20 mm wide and 19.3 mm thick, with a thread hole diameter of 4 mm. The cord has a diameter of 3 mm. Collected by Percy Horace Gordon Powell-Cotton and his wife Hannah at Fanamweir on 3rd May 1933, during a shooting expedition. This type of necklet is called woat. Accession Book Entry [p. 248] 1934 [insert] 8 [end insert] - MAJOR P. H. G. POWELL-COTTON , Quex Park, Birchington, E. Kent. Specimens collected by himself & Mrs Cotton, during hunting trips, 1933, viz: - From the DINKA tribe, FANAMWEIR & KORNUK, WHITE NILE [...] [p. 250] [insert] 23 [end insert] - Woat , necklet of large wooden beads, FANAMWEIR (2107). Additional Accession Book Entry [p. 249] - 1934.8.23 No given AP [red biro] A20 F10 11. Related Documents File - Typewritten List of "Curios Presented to Dr. Balfour by Major & Mrs. Powell-Cotton. Dinka Tribe". 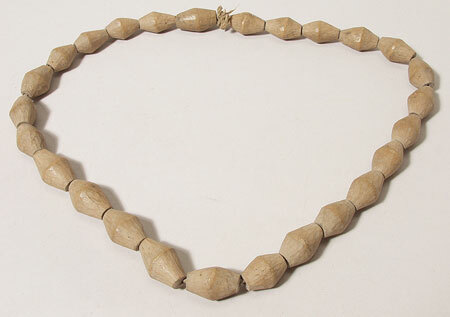 This object appears as item 2107: "Wood bead necklace, native name woat , 3/5/33 Fanamweir, 8.55 N, 28.42 E". Also contains details of a cine film 'some tribes of the Southern Sudan', taken by Powell-Cotton during this 1933 expedition, copies of which are now in the National Film and Television Archive and the Powell-Cotton Museum in Kent [RTS 14/3/2005]. Old Pitt Rivers Museum label [rectangular, metal-edged] - Woat , necklet of large wooden beads, DINKA, FANAMWEIR, WHITE NILE, 8° 55' N., 28° 42' E. d.d. Major Powell-Cotton, 1934 (2107) [front], 1934.8.23 [back]. Written on object - 2107 [pencil; RTS 18/6/2004]. Sparks, Rachael. "Dinka necklet" Southern Sudan Project (in development). 03 Jan. 2006. Pitt Rivers Museum. <http://southernsudan.prm.ox.ac.uk/details/1934.8.23/>.